Michael Titterton (l.) across the pitch table from José A. Fajardo (r.); Dave Pellegrin in background. 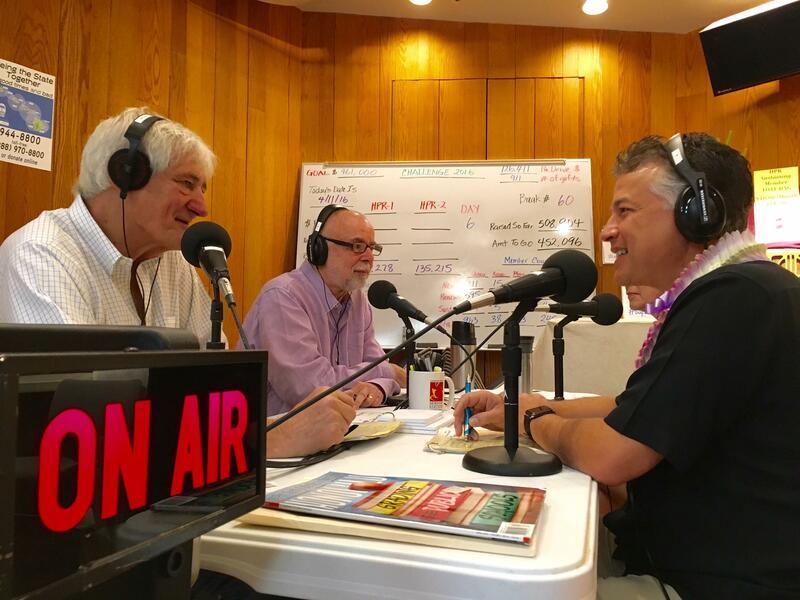 The drive briefly introduced HPR's next leader, José A. Fajardo, who, for several days, shared in the on-air pitching for the nonprofit. In the final days of the drive, current President and General Manager Michael Titterton, stepping down on June 30, received news that the Board of Hawaiʻi Arts Alliance has selected him as the 2016 Alfred Preis Honoree. “I am so touched by the many paens I’ve received over the course of the last weeks,” said Titterton, “but truly, the credit goes to the amazing community of HPR supporters. They have built this statewide network dollar by hard-earned dollar and these stations are really a testament to their generosity. It is their gift to the citizens of these islands." Ninety-three percent of the funds required to operate the HPR network are raised from within the state, with support from individuals and families making up 63% of those revenues. Challenge 2016 gathered a total of 2,757 individual gifts, and recruited 478 new monthly subscribers. These “Sustaining Members” now comprise more than a third of the station’s membership. Of the gifts received, 505 were from Hawaiʻi Island, where construction on the last piece of HPR’s network, a transmitter on Kulani Cone above Hilo, began during the drive. This facility will soon provide to East Hawaiʻi an improved signal to HPR-1 (KANO 91.1) and for the first time HPR-2 (KAHU 91.7). Photos of the early stages of building may be viewed here.